The M1 Garand is a semi-automatic rifle that was mostly used by the US Army during World War II and the Korean War. It has an internal eight-bullet box magazine, which is loaded with clips of 8 bullets. When the last round is shot, the empty clip is ejected, making a "ping" sound. 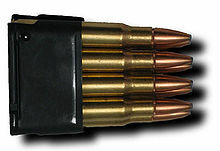 A common misconception (seen in video games such as Call of Duty) is that the clip can only be removed by shooting all the bullets, but the clip may be removed at any time (but it is hard to do). General George Patton described it as the greatest battle implement ever designed. It was replaced by the M14 rifle in the late1950's. Japan: Captured from U.S.Army during World War 2. North Korea: Captured from South Korean Army and U.S.Army during Korean War. This page was last changed on 5 October 2017, at 03:06.